I had a “practically perfect pregnancy” (Cristina the midwife, 2017) so really I should’ve guessed the birth wouldn’t be so spot on. In the build up to having my first, I researched the fudge out of labour. Honestly, I studied it harder than I did my GCSE’s. I can’t tell you the amount of positive birth stories I watched on YouTube, all these women having the most beautiful births. I’m going to have one of those of my own... enter a not so well positioned baby and those thoughts kind of have to go by the wayside. Now before I carry on I think it’s important to point out that although my birth story isn’t a story of the most beautiful birth, it is a story of an intervention full BUT positive birth. If, like me when preparing for bringing a baby into the world, you want to fill your mind with the most beautiful of ideals, that’s fine! BUT I’m writing my story because I only wish I would’ve done a little more research into what happens when the plan has to change. So if you think that might help you read on, if not then don’t. I TOTALLY get that. I probably wouldn’t of wanted to read this either back then. So I guess I’ll start at 40 + 4. The pool was in the nursery already to go, we were going for a home birth, and a midwife was coming along to see me for possibly the last time. She checked me over and told me despite what the charts said all along (an average baby) she thought he’d be more along the lines of 6lb 10... great! This is going to be so beautiful!!! FYI the charts can be wrong, he came out at 9lb 4!!!! The following evening my waters broke, around midnight and then it started. The surges were fine, nothing I couldn’t handle. Not close together but felt fairly strong, strong enough to not allow me to have any sleep, sleep which was strongly advised by the midwife at the end of the phone at 2am. Now basically that was that for this part but unfortunately this part lasted 24 hours. Surges strong, but with no rhyme or rhythm, 3 in 15 minutes - 1 in 20 minutes. Hopping in and out the pool to get things going, walking around and around the street, up and down the stairs, in and out the shower! I hadn’t been so active in weeks. Eventually things started to crank up a notch, apparently I was making “transitional sounds” and our gorgeous midwife kept disappearing behind me to see if he was here yet, nope, still no baby. She checked his heartbeat and at this point, as I relaxed in the pool between the surges 24 hours in, there was a dip in his heart rate. We changed positions, this time out of the pool and onto our bed, heart beat checked again... another dip. And this is the point the beautiful ideal changed. It was standard procedure to have to transfer to the hospital at this point, two heart rate dips and constant monitoring is required. As we waited for the ambulance I had my first examination.. 7.5cm wow!! All that way with nothing but a bit of gas and air... a new calm came over me. I remember the midwife saying “he might still arrive before the ambulance” ha! Nope!!! When we arrived at hospital it was back to where we were at home, surges sporadic and no more dips in the heart rate... typical! So I carried on doing what I was doing for another 6 hours. So here we are 30 hours in... I can’t keep doing this. I’ve been awake for almost two days. So what are the options? My birth plan said I can do this at home with gas and air.... I think it’s time that plan got adapted. I remember Lynn (ah Lynn) another gorgeous midwife asking me if I could do this for another 30 hours, I think the look on my face suggested otherwise! An epidural was ordered so I could try and get some rest... 3 hours later a second examination, guess what, you’re 7.5cm. Whoopie di do, I was that 9 hours ago! This birth needed to happen, so out came more drugs, the induction drug, cranked up to the most they could give me. Another 3 hours later, still no baby...enter Ian. Ah Ian, Super Consultant Ian, who had informed me for all the attempts I was making this baby “is a toad, and has decided to come out with his head on the side. Basically you can carry on trying but it’s looking highly unlikely you’ll be able to do this without any help." I remember at this point begging for a c section! Me, the only natural/water birth/hypnobirthing mum to be, begging for a c section. Must’ve been serious!!! I didn’t get the c section I (apparently) wanted, instead Super Ian got him out with a fair bit of force and some forceps. Which in the end, resulted in a fair amount of blood loss and a stay on the high dependency ward for myself... but that’s another not perfect but positive story. 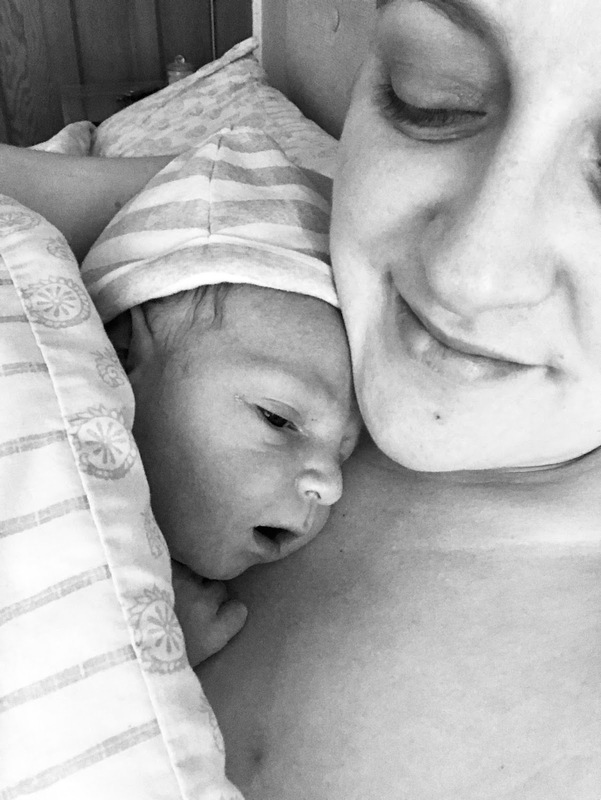 Anyway, the main reason I want to share my birth story is because even though it was at times stressful and pretty scary, it may seem strange that I can say it was nothing but positive. We took a class in Hypnobirthing at 20 weeks pregnant and I honestly think if it wasn’t for that course my mind would’ve been in a very different place. It helped me to stay calm and focused when things weren’t going to plan. The care we received during labour also helped things stay positive. The midwives and consultants are honestly super humans. I never once doubted them and put all of my trust into them helping us make informed decisions about our birth. They ensured as much of our 'Birth Plan' would be honoured and respected although it looked very different to the initial ideas. So positive in fact that 4 weeks after Theo’s arrival someone asked me if I could do it all again... hell yer!!! Look at what is here for all the effort! Now I'm not saying I felt this positive the about the experience the following day but once the sleep deprivation and hormones had settled down, I could see Theo's birth for what it was. Not perfect - but positive. We will try for a second, I’m not scared or put off and we think we will try to complete it all at home, in a pool, like we wanted, our incredible aftercare has told us it is possible that could happen. But if it turns out that that baby wants to, in the words of Super Consultant Ian, be a toad and have a little help getting here, that’s fine too. Any which way these little ones want to arrive is fine by me but if you could do it a little quicker than 36 hours that would make me a little happier and much less sleepy.